Gone are the days when America and Russia used to battle it out for supremacy in space ; trying to put the first man in space, landing a man on the moon and bringing him back safely. Nowadays the two old rivals are quite happy to invest their joint knowledge and resources in the maintenance of the International Space Station. But there’s a new space race going on, not between two superpower nations, but between privately-owned space vehicle launching companies aiming to put the first commercial private astronaut into space, kicking off the much anticipated era of space tourism. astronauts having crossed the Karman Line – an altitude of 100 kilometres where space begins. The price of these tickets will start from $150,000, reservations are being made and anybody who is physically and mentally fit will be able to go. There are others such as the Swiss Suborbital Aircraft Reusable, or SOAR, ESAs Space jet or Copenhagen Suborbitals but these are just concepts that haven’t made it off the drawing boards yet. Virgin Galactic is owned by Sir Richard Branson. Their two-stage rocket ship is based upon the 2004 Burt Rutan X-prize winning SpaceShipOne. 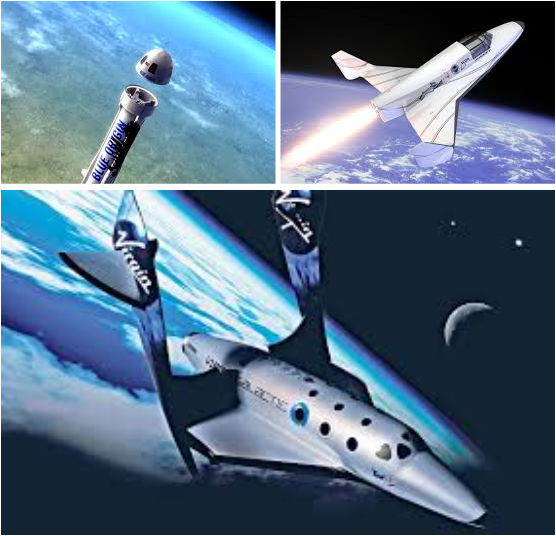 The VG configuration consists of a turbo-jet mother plane called the ‘White Knight’ which carries the rocketship, SpaceShipTwo, to an altitude of 15,240 metres before releasing it. SpaceShipTwo, designed to carry six passengers and two pilots, then fires its rocket engines sending it streaking into space at 4,200 km/h. Passengers will be subjected to a maximum of 4Gs, experiencing up to six minutes of weightlessness before returning to Earth in an un-powered glide. Next on the list is Blue Origin, the rocket company owned by Amazons Jeff Bezo. His single stage to sub orbit rocket called the ‘New Shepard’ takes off vertically lifting a capsule that can carry six people. At an altitude of 40 kilometres the capsule separates and carries on into space under its own momentum whilst the booster section returns to the launch pad for a vertical powered landing. The capsule – with its six occupants – later returns to Earth by parachute, touching down not too far from the launch pad. The last contender on the list is the most unusual of them all as it doesn’t take-off vertically like a rocket and neither is it dropped from a mother-plane. It takes off from a runway like a normal plane. Called the Lynx spaceplane it’s roughly the size of a jet-fighter and sits a pilot and passenger. Taking off horizontally from a runway its four LOX-Kerosene rocket engines soon accelerate it to the speed of sound and beyond. Climbing at a steep forty-five degrees it soon leaves the Earth’s atmosphere behind where the lone occupant(-and pilot) will experience a few minutes of weightlessness, see the curvature of the Earth before returning back. All three space vehicles have been built and are currently undergoing trial before commercial flights can commence. These trials are necessary to make sure they are safe and don’t blow up on ascent or crash on landing. Virgin Galactic lost a spaceship in a much publicized crash in 2014 which killed one of the test pilots. Modifications have since been made and they have a new craft up and flying. Just like the Wright Brothers kicked off manned flight in 1903 it’s believed in 2020, or earlier, the first private commercial sub-orbital fights will be commencing. The question is which of these companies will be the first.